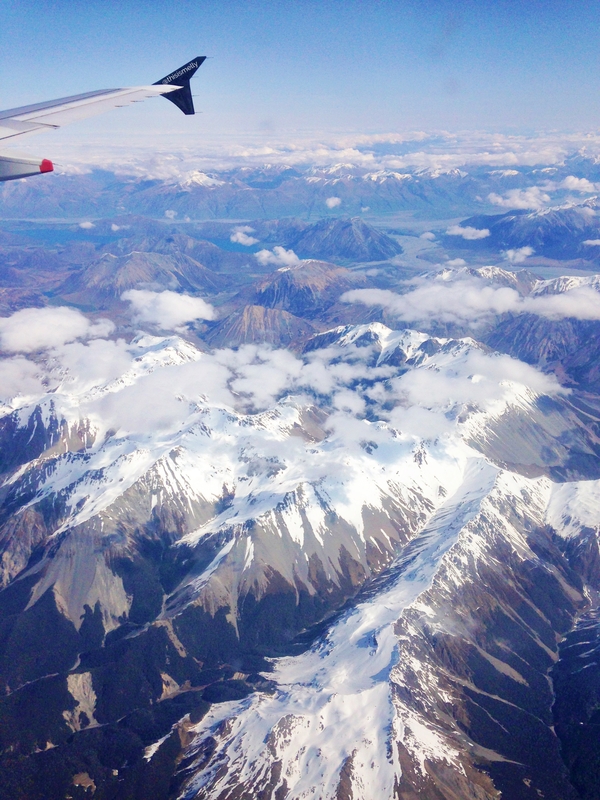 Being that New Zealand is only a 3 hour flight from Sydney, I didn’t expect to be so profoundly effected by my recent trip. My soul is renewed. I feel more centred and at the same time, closer to my husband. A fog has been lifted from myself. 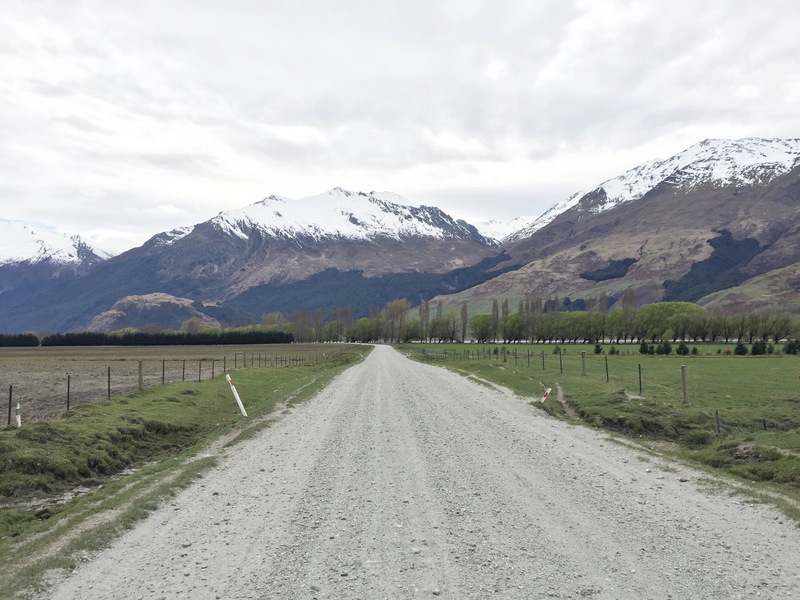 Under the cover of the Super Moon, we made the drive through some of the most beautifully treacherous countryside on our journey from Christchurch to Wanaka past Tekapo, Twizel and the mountains inbetween, under the glow of the largest moon we’d ever seen. 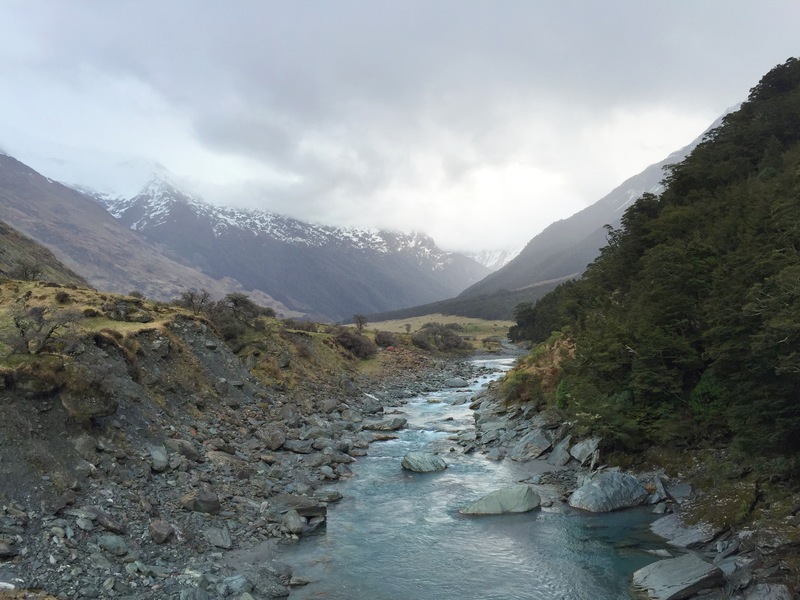 A signpost told us we were passing through the Aoraki Mackenzie International Dark Sky Reserve. We opened the car windows, the cool night air streaming over us, and marvelled at a landscape; beautifully and eerily illuminated by the Super Moon and a billion bright stars with the blackest backdrop to contrast their brilliance. It is the largest light reserve in the world and is almost totally free of any light pollution. It rivals the night skies I’ve seen in the Australian Red Centre. Despite our 11pm arrival at the Manuka Crescent Motel, which we booked just for the night, the motel staff were lovely and accommodating. It’s a cheap & cheerful stay (also the title of my review on TripAdvisor found here). We awoke refreshed, checked out the cute town centre of Wanaka for breakfast (my TripAdvisor cafe review on Relishes) and then buzzed with sufficient caffeine (Kiwis make all regular/small coffees with a double shot of espresso we later found out!) 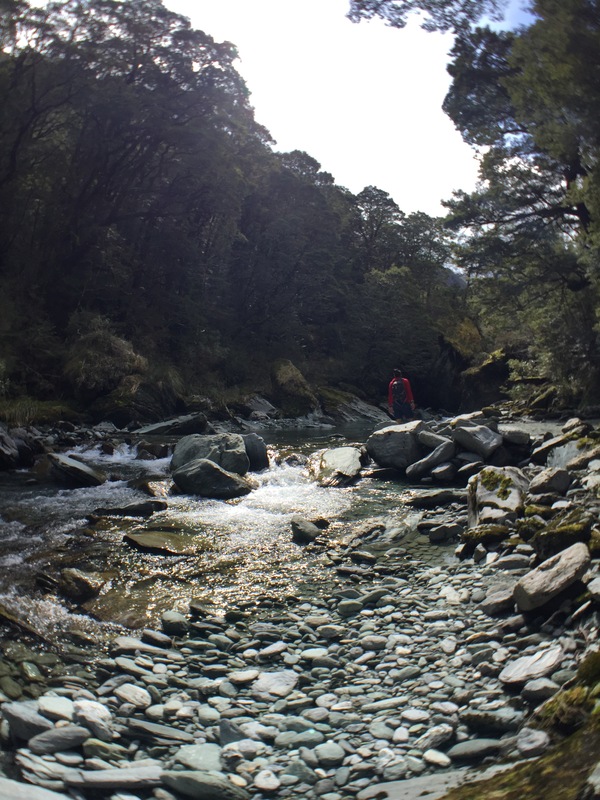 we head off to trek to the Blue Pools located in the Mt Aspiring National Park. The scenery is so consistently awe inspiring that we are constantly uttering “OMG this is amazing!” or exclaiming “look over there! 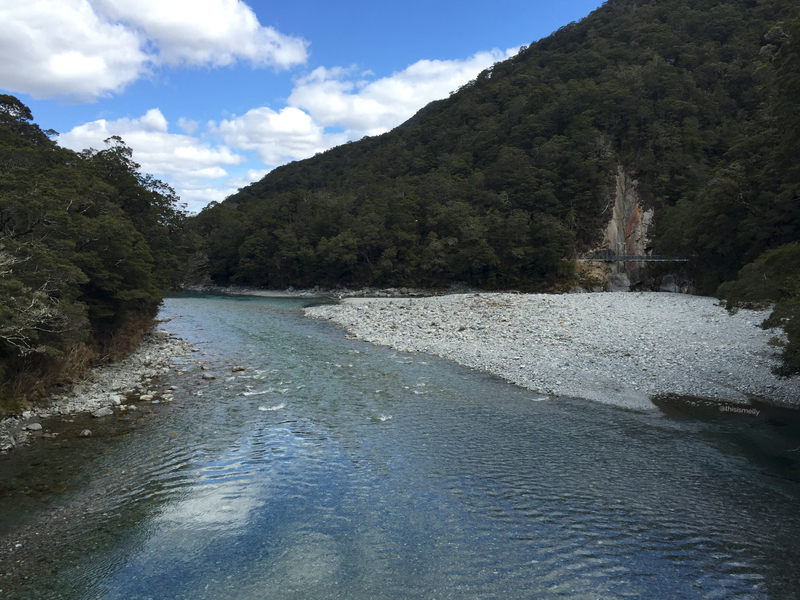 look over there!” or reverently sighing “oooh my god” as we drive just over an hour out of Wanaka into the Mount Aspiring National Park to reach the walking track to Blue Pools. 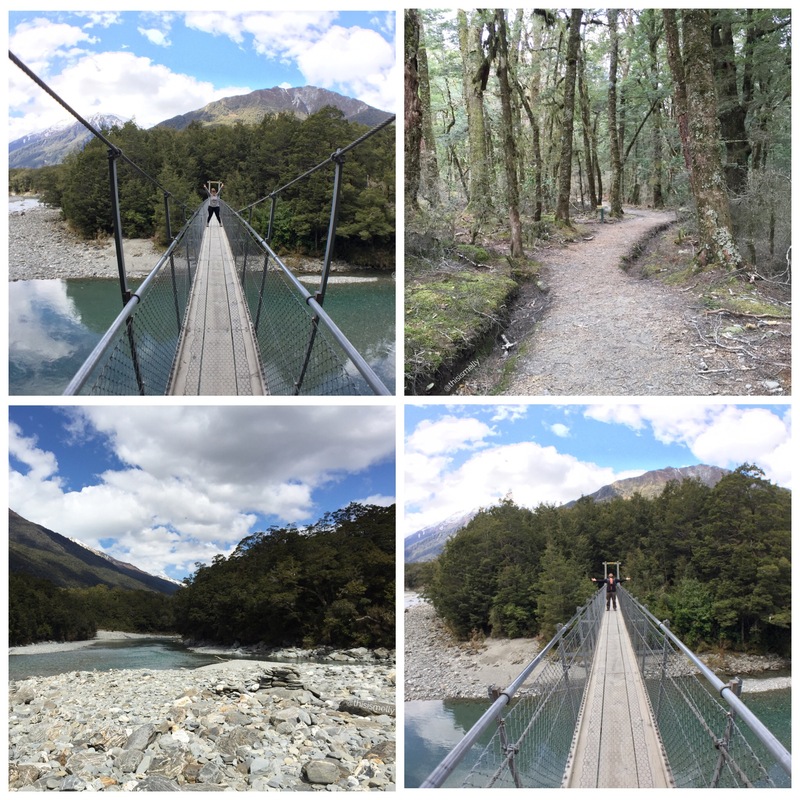 It’s an easy 20 minute gently-downhill-sloping walk through native Kiwi forest of beech trees, ferns and mosses, before getting to a long swing bridge which passes 40ft above a beautiful flowing glacial river. 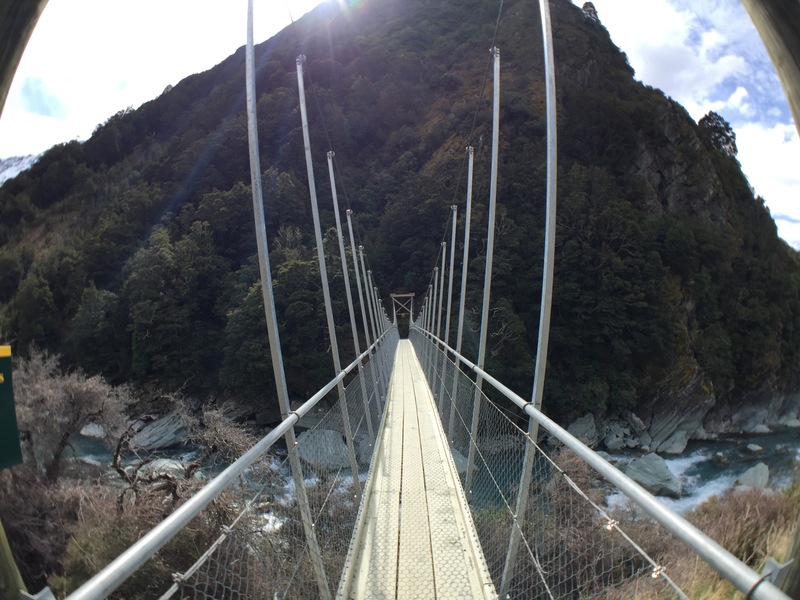 We re-enact Indiana Jones as we cross and feel all the more adventurous for it! The smell of the rainforest surrounds you; clean, earthy, peaty. At first the rush of water can be heard in the distance, and increasingly gets louder until suddenly the forest splits open to reveal the rushing river. 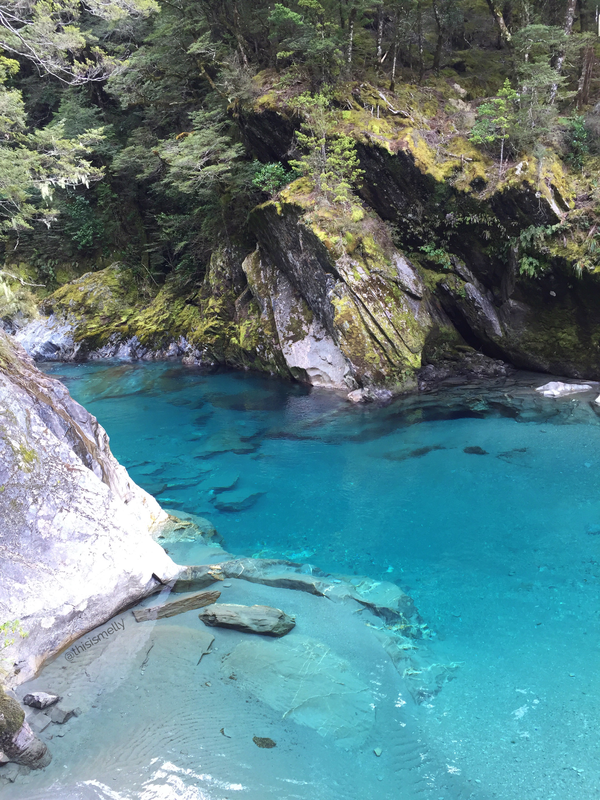 The water is so crystal clear with a turquoise hue. It’s fed from a pure glacier up river. Part of me wants to dive straight in for a swim, but it would be unbearably freezing!!! 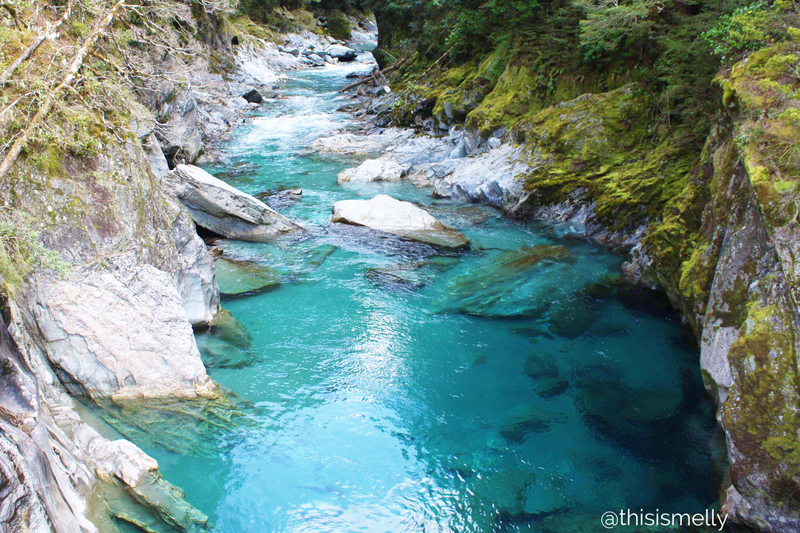 The Blue Pools takes your breath away; its the colour of the most intense azure. It’s mesmerising to stare into and incredibly deceiving in depth because of the clarity. It is truly stunning. 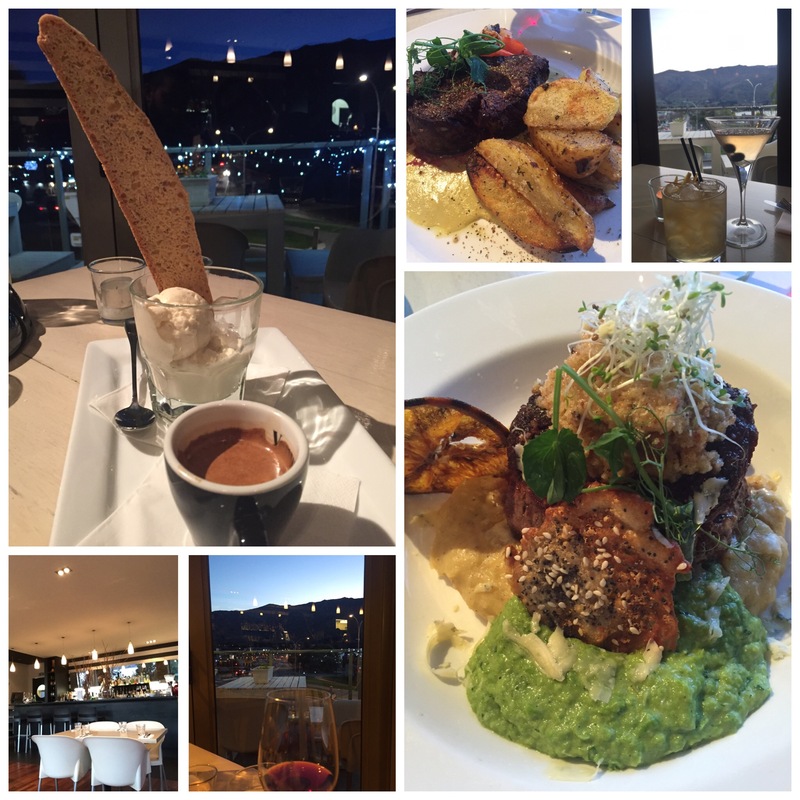 That evening we ate at a lovely restaurant in Wanaka with a view over the little town and lake. I ate the most delicious lamb dish (quinoa & pea purée with blue cheese crisp) followed by an affogato for dessert. 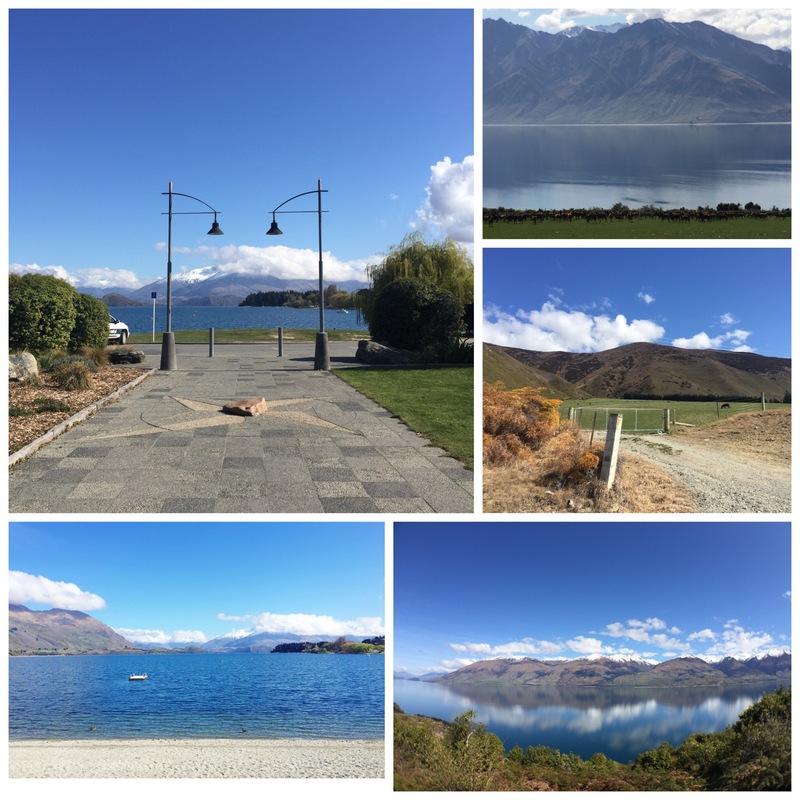 We stayed the remaining two nights in Wanaka at the Mercure Oakridge Resort. You can read my review on TripAdvisor here. 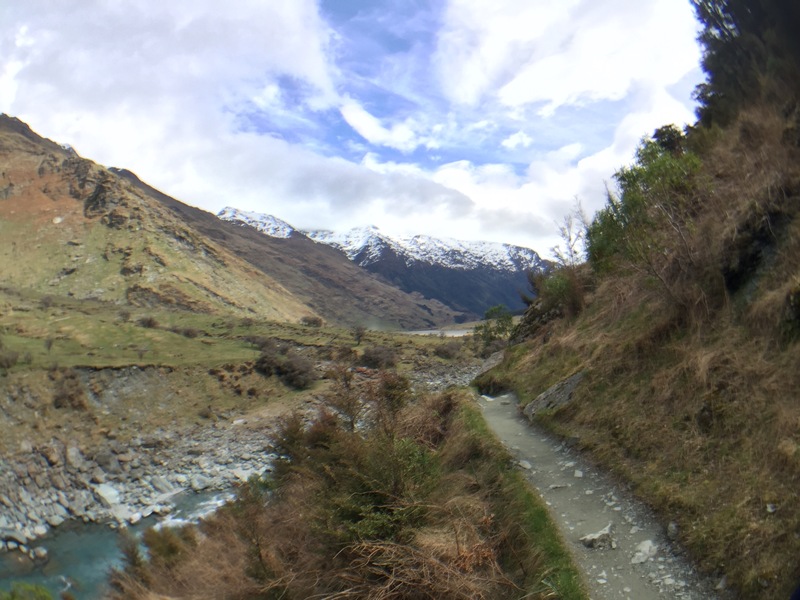 We planned for a few small hikes (couple of hours) and one or two longer ones (full day) during our time in NZ, with Rob Roy Glacier being the first of the decent walks. 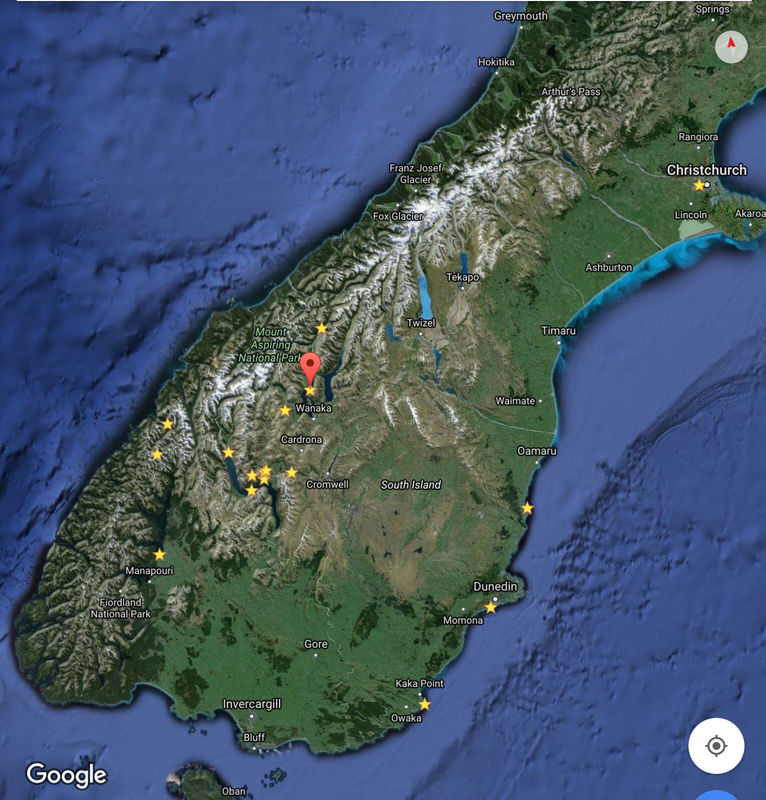 We drove south-west out of Wanaka, past the ski locations like Treble Cone and the calm waters of Mirror Lake. 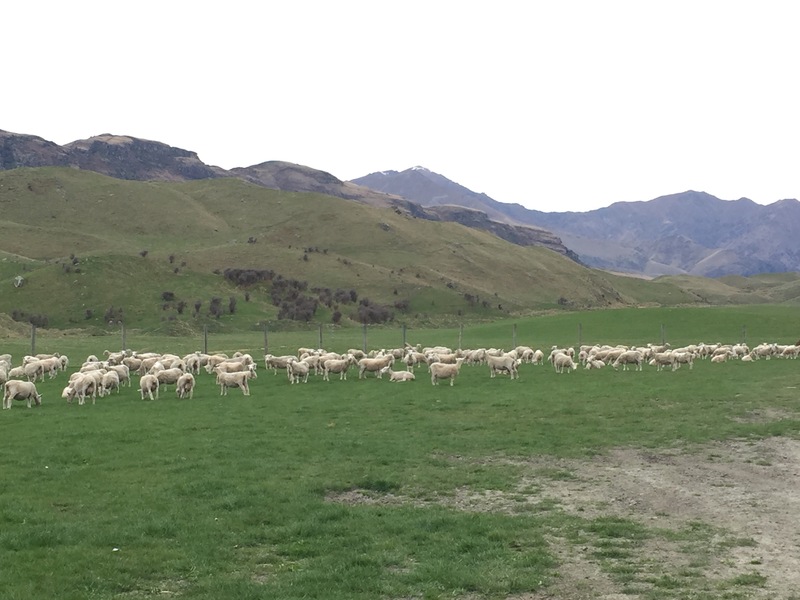 To get to RRG, which is also in the Mt Aspiring National Park, you drive through several private farms and get to see an abundance of sheep, cattle and deer all with their spring babies! 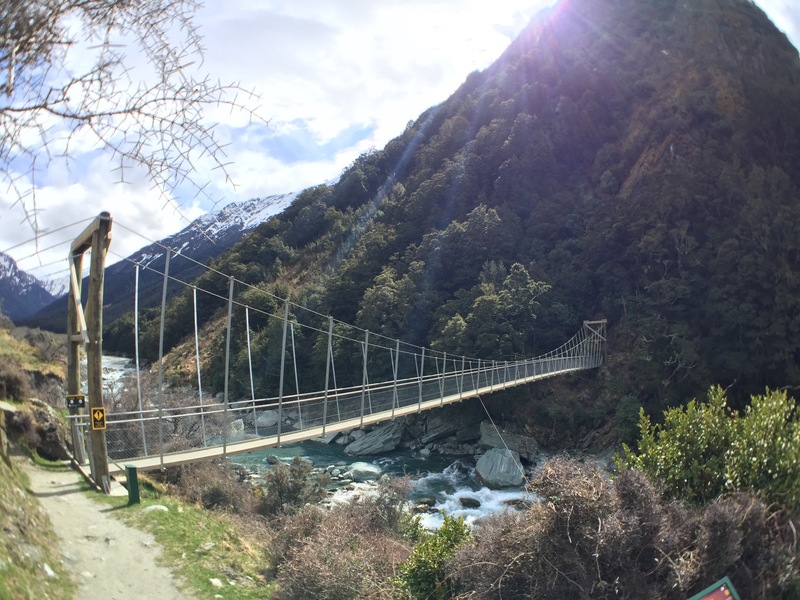 The Kiwis rate this hike (aka tramp) as ‘average’ difficulty but I have to admit I found it hard. 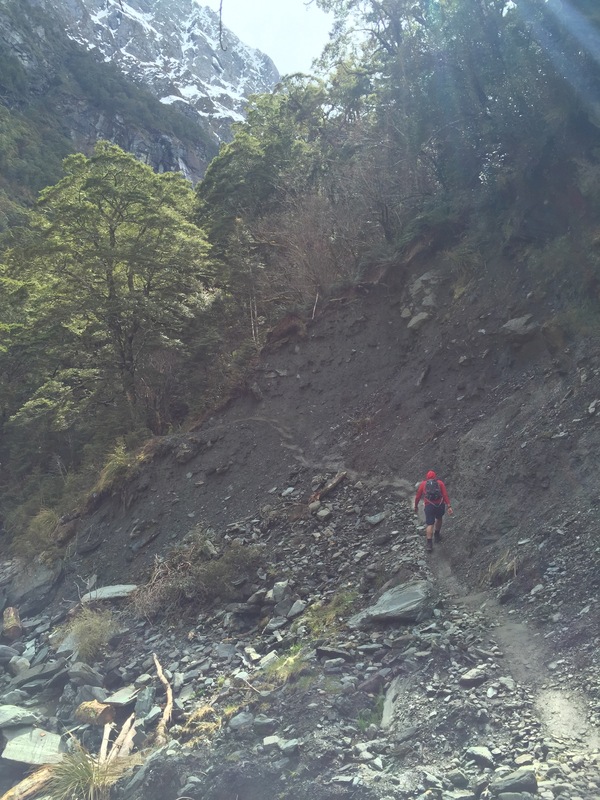 It’s a 16km return walk, with a steady incline the whole way on the ascent (you are climbing a mountain after all!) 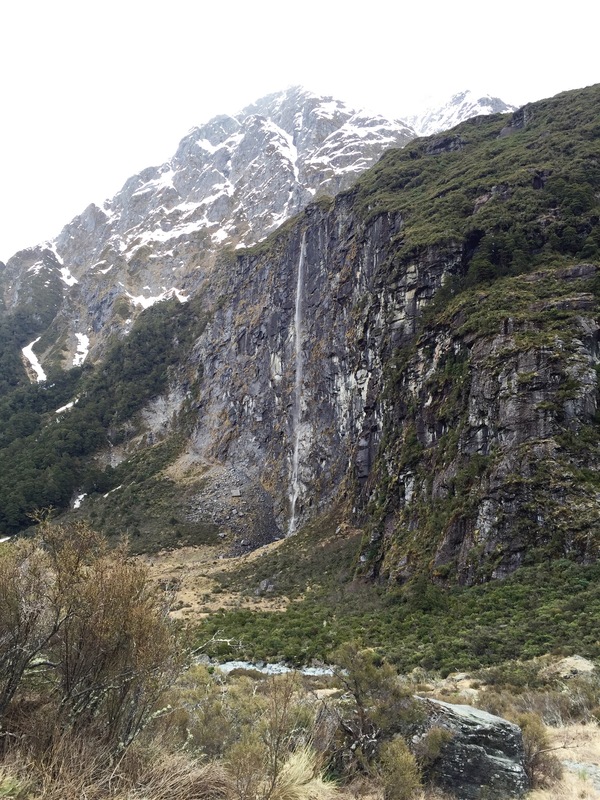 and in some areas you are almost rock climbing up vertical faces to proceed. There were a few recent avalanches in spots that made passing a little treacherous but we persevered. It took us 3 hours ascent, 30 mins rest at the summit and 2 hours descent. I almost vomited once but I didn’t fall over! There were so many times I wanted to turn around but I am so glad I had my ‘squad leader’ husband who wouldn’t let me give up and even tolerated my singing ’99 bottles of beer on the wall’ (except that I started from 200) and poorly reenacted Pulp Fiction along the way out of exhausted silliness! 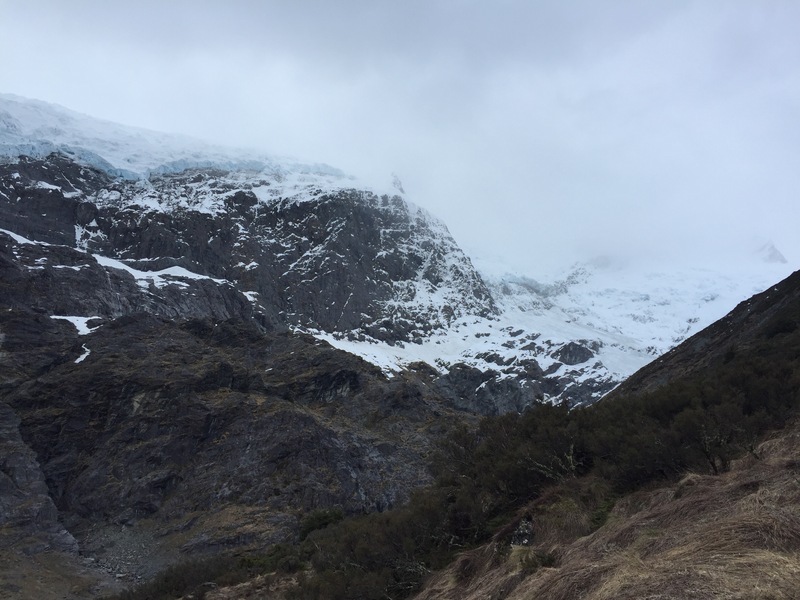 The reward was incredible; stunning scenery that changed several times as we passed through different micro-climates, and an honour to see a hanging mountain glacier with my own eyes. 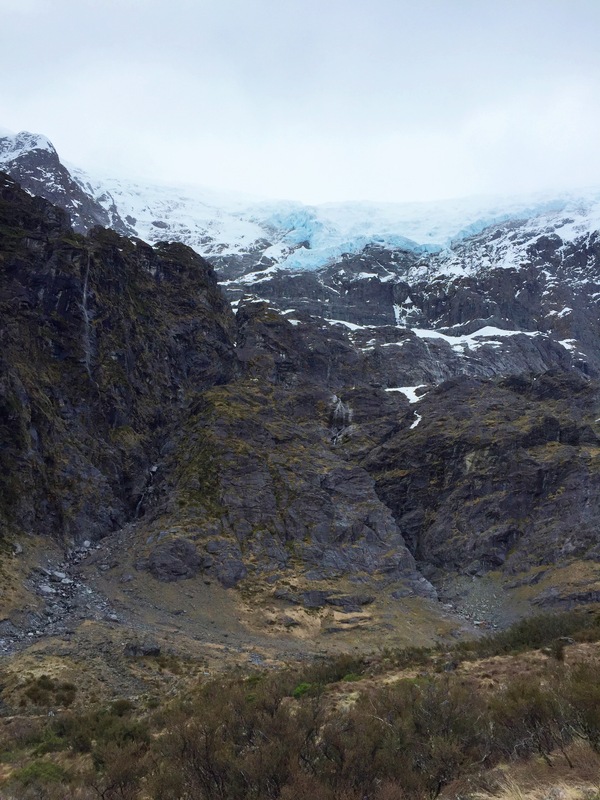 While we were sitting in awe (& building lactic acid) at the summit we witnessed several serac falls, where large chunks of ice break off and start mini slips and avalanches. It sounds like thunder rolling right over you. Sitting in the tussock grass at 4900ft, at the base of a glacier, you realise how insignificant you are, how small your body is within nature. It was truly breathtaking.